The DROID X appears to have welcomed in a $50 price drop to $149 online which is usually a good sign that the device is about to hit “end of life” status. 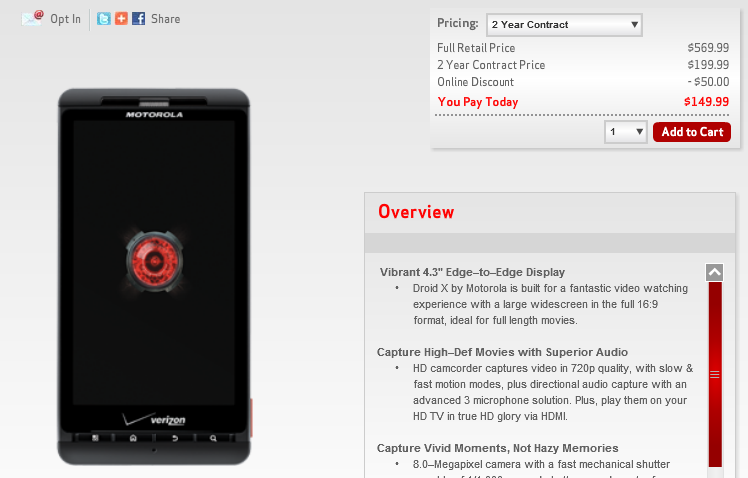 We know the DROID X2 is right around the corner and step 1 towards device re-hash usually starts with pricing adjustments. We’ll hold off from doing a formal eulogy until we actually see a DX2 announcement, but if you feel like expressing your feelings for this device, now would be a good time to start preparing them. Original DROID discounted to $149 on 6/11/10 – DROID X released 1 month later on 7/15. DROID 2 price drops to $149 on 11/1/10 – DROID 2 Global released 11/29. And on a related note, if you try to find the DX on Verizon’s normal site, you won’t. As of right now, you can only access the phone by starting at droiddoes.com and then redirecting to their new and incredibly slow Flash site. Update 1: Phone is back on VZW’s regular site. Nice to know they read this blog of ours.